Before the SNL staff leave this Wednesday, I need to acquire a better understanding of past and potential future source term release estimates that are based on their latest analyses of each rx and spent fuel pool no. 4. For this meeting to be productive and efficient, a RST member from the embassy team with severe accident knowledge should participate in the meeting in support of the PMT’s objectives. 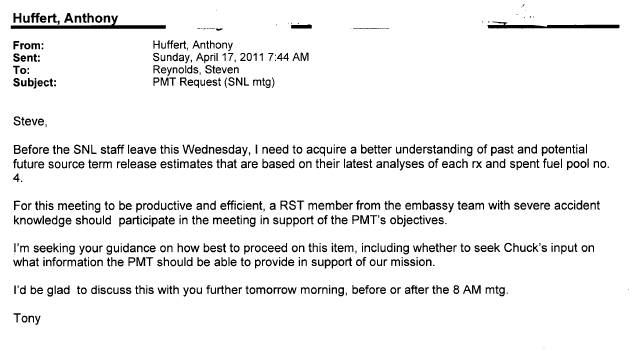 I’m seeking your guidance on how best to proceed on this item, including whether to seek Chuck’s input on what information the PMT should be able to provide in support of our mission. I’d be glad to discuss this with you further tomorrow morning, before or after the 8 AM mtg. <b>Our FOIA archives feature collected and sorted FOIA documents, and are sub-categorized by event, topic, importance, and type. Email chains are extracted and published according to date. Press releases are archived by date of publication. Presentation materials and pdfs are summarized and displayed in whole. Each post is titled with the date of transmission of that particular FOIA combined with the subject of the message.